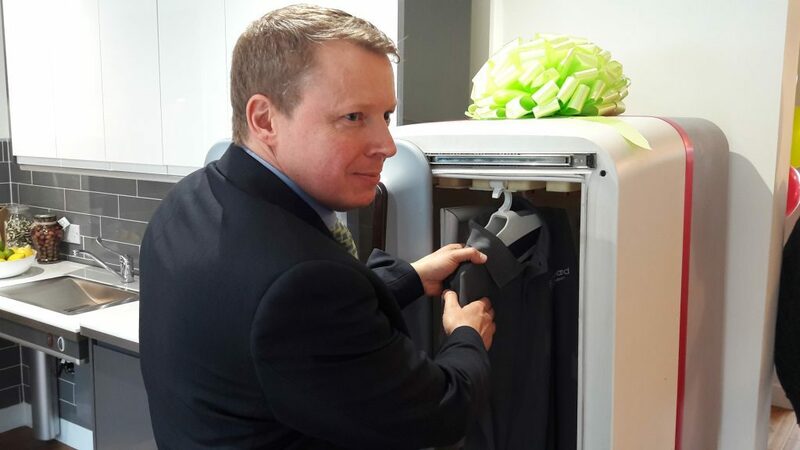 A washing machine that cleans and irons clothes, kitchen units that lower at the touch of a button and blinds that automatically open and close to increase the chance of a good night’s sleep. 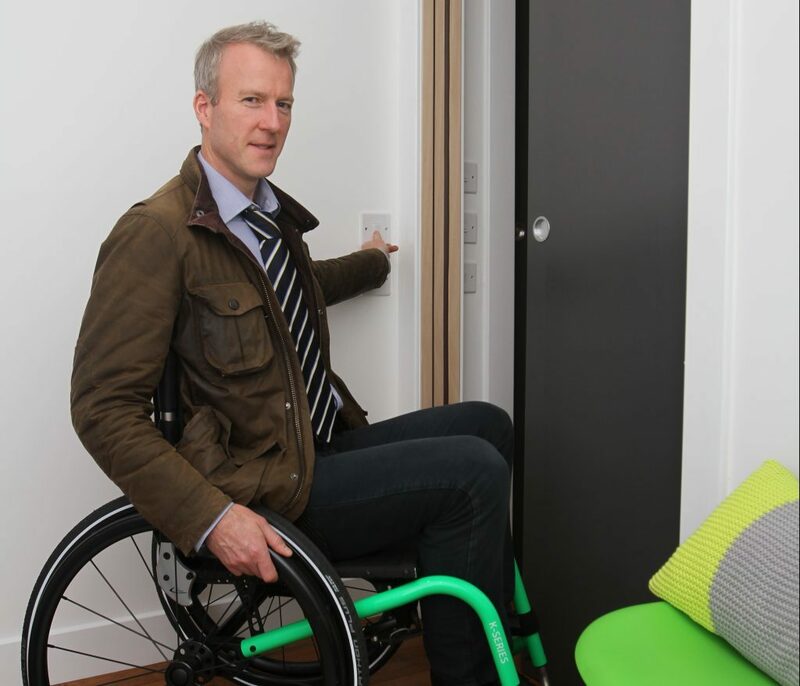 But these state of the art features are all very real aspects of six pioneering homes that were launched in Dundee on Thursday to help transform the lives of people with disabilities. Housing and care provider Blackwood has designed six innovative houses that set a new standard of accessibility, with the help of technology and modern construction. Max Brown, chairman of Blackwood, welcomed the Minister of Local Government and Housing, Kevin Stewart to the official opening of the newly constructed Blackwood House development off Glamis Road. It’s a design blueprint for flexible living which Edinburgh-based Blackwood plans to roll out in increasing numbers across Scotland. Councillor Ken Lynn, chairman of Dundee’s Health and Social Care Partnership was also present to welcome the contribution that these homes make to the city’s new plans to help people live independently. Picture shows; C.E.O of Blackwood Fanchea Kelly with Minister of Local Goverment and Housing, Kevin Stewart. Mr Stewart said: “I’m delighted to open this development of accessible and connected homes in Dundee. 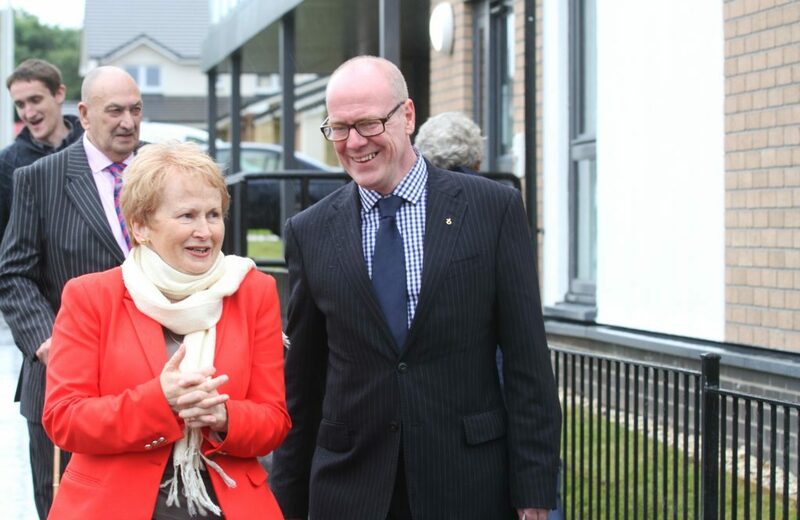 “The ‘Blackwood House’ is also a great example of how suitable housing can contribute to health and wellbeing outcomes both for the people who live there and more widely for the local health and social care partnership. Fanchea Kelly, chief executive at Blackwood, said it was a first demonstration of what great design can do to improve health and ultimately change lives, with existing customers helping in the designs. She said: “We believe that these beautiful, highly accessible and affordable homes will enhance the lives of our new tenants. 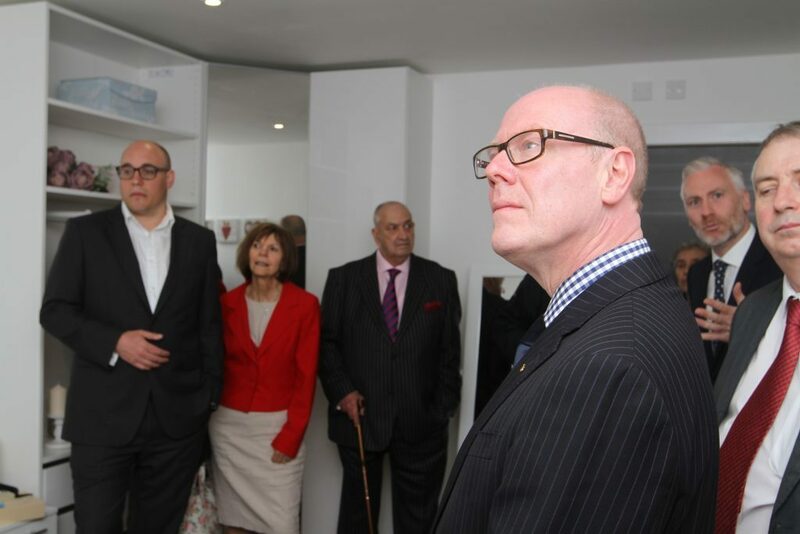 Minister of Local Goverment and Housing, Kevin Stewart being shown around the homes. The project was an example of joint commissioning between Dundee City Council, Dundee’s Health and Social Care Partnership and the Scottish Government. The team worked with CCG as developer, Blackwood’s own staff, and technology partners, with funding provided by Triodos Bank allowing it to move from concept to reality over the last year. Blackwood is now in discussion with a number of other local authority areas and has ambitions to build more Blackwood homes across Scotland over the next few years. When you are an able bodied citizen who can stand, walk and move, the chances are you don’t think twice about getting up to close the curtains, wash your hands or pull a mug from the kitchen cupboard. But for people who are confined to a wheelchair or have limited mobility, many simple everyday tasks could be difficult or nigh impossible. That’s where the pioneering Blackwood House design comes in where the bespoke smart technology care system CleverCogs enables customers to open blinds, switch on TVs, order shopping, or keep in touch with family, friends and carers through touch screen devices. Crucially it also allows residents to remain as independent as possible in their own homes. 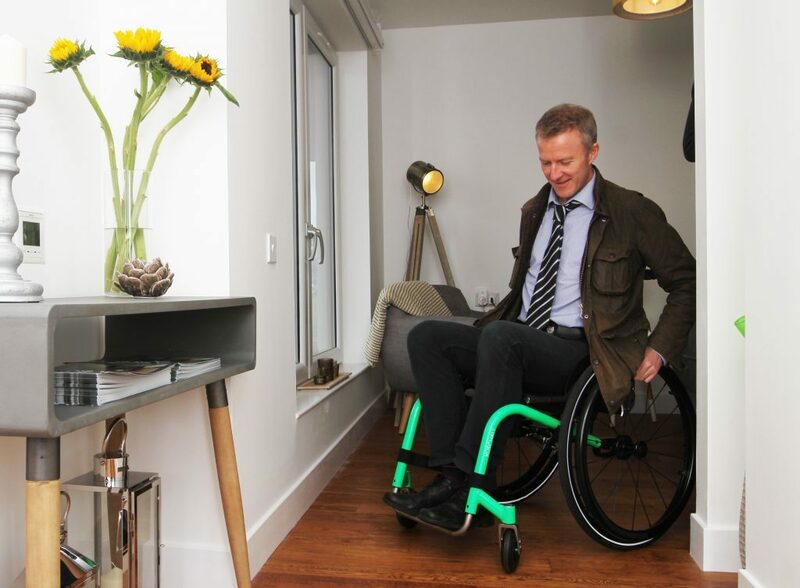 I’d never sat in a wheelchair before let alone manoeuvred myself through a house in one. The Courier’s Michael Alexander ‘road tests’ the new wheelchair friendly Blackwood House in Glamis Road, Dundee. But on Thursday, to coincide with the official opening, I was given the opportunity to ‘road test’ the new Blackwood House in a £3000 sports wheelchair which, I was reliably informed, could “turn on a sixpence”. Once I had mastered how to go forward, back and turn, I set off on a journey of exploration through the ground floor property. The hall and doorways have been designed with wheelchairs in mind, giving just the right space to turn. Sliding doors between rooms are controlled by the touch of a button at wheelchair height, while in the bedroom the simple touch of an iPad closed the automatic black-out blinds. The adjoining toilet and shower room – also accessed through an automated sliding door – was spacious with a key feature being the sink that could be lowered or even moved to the side to accommodate specific wheelchair needs. Highlights in the kitchen were the movable fittings, the rise and fall units and the much anticipated Brompton Washscape machine that remarkably not only washes and dries, but also irons laundry. Now that sounds like it could be a welcome addition to any home!